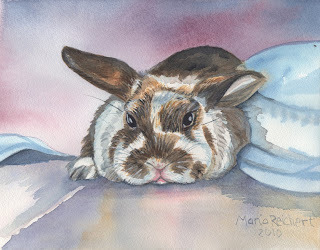 This is an 8 by 10 inch watercolor of Patches, our mini lop ear rabbit who passed away last year. She was given to us because she had one ear that stood up and one that flopped, I guess this is not thought highly of for show or breeding. We owned her for nearly 10 years. She came for the kids on Easter Sunday. She lived in a hutch, in our barn for a short while, but then moved in to our screened in porch shortly after. She has played dress up with the kids, been carted around in a baby doll stroller, shared the dog bed with our big Australian Shepherd. She lived a charmed life, was litter trained, had a play pen for inside and outside, so she could get her exercise. Kids would make her toys from paper bags, paper towel holders, boxes with holes cut in them. She loved to hide under paper bags and towels. She taught me a lot about pet rabbits that I never learned in school. Primarily that they are very playful and curious, need lots of people time, toys and interaction, do not like to be alone, and have tons of personality. When my daughter and I volunteer at our local humane society, we see lots of rabbits who are turned in. They start out as cute Easter gifts and are not cared for when the kids lose interest. Here is a great web site for anyone with rabbits or would like to own a rabbit, it has lots of care and play information. It is named House Rabbit Society. I visited an art gallery in Seattle a few years back and was greeted by the resident rabbit who hopped over to say hello, and moved on to his own business. They make great gallery companions, quiet, playful, not too much noise, litter trainable, don't need to go out for walks, check out your local humane society, maybe you could give one a good home. What a super cute painting and a great story about a sweet bunny! what a pleasure - beautifully painted and learning something about animals - beautifully written too! 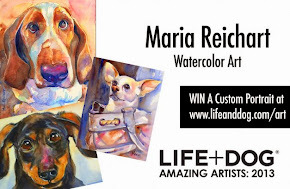 Thanks Gretchen and Robin for your comments, I love to post pictures and hear nice words, it is very motivating for more painting! I am not sure what is next on the painting easel, it may be a surprise for you as well as me. I love your painting and also hearing about Patches! I grew up having two pet rabbits and I still miss them! They each had their own distinct personalities. I think the ones with one ear up and one down are adorable! Thanks Theresa and Crystal, Patches added so much fun to our family, she was truly a unique personality! Have just come home from a horse show with my daughter and her horse, but look forward to painting some more next week. Thank you Karsten, it is amazing how our pets touch our lives, thanks for visiting. Maria ~ I love this one of your Patches. Beautiful bunny! We just lost our lop Patches last month. Missing her lots. Bunnies make such awesome pets, they really have HUGE personalities if people will only bring them into their homes and take the time to get to know them. Bridget, we miss her a lot, as you said she had so much personality.